May 26, 2016 – Smackdown: Fandango and Tyler Breeze defeated The Golden Truth (Goldust and R-Truth). May 30, 2016 – RAW: The Usos (Jey Uso and Jimmy Uso) defeated Fandango and Tyler Breeze. June 3-5, 2016 – Live Event: R-Truth (w/Goldust) defeated Tyler Breeze (w/Fandango). June 6, 2016 – RAW: R-Truth (w/Goldust) vs. Tyler Breeze (w/Fandango) ended in a no contest. June 19, 2016 – Money in the Bank Kickoff: The Golden Truth (Goldust and R-Truth) defeated Breezango (Fandango and Tyler Breeze). June 24, 2016 – Main Event: The Golden Truth (Goldust and R-Truth) defeated Breezango (Fandango and Tyler Breeze) in a dark match. July 2, 2016 – Main Event: The Golden Truth (Goldust and R-Truth) defeated Breezango (Fandango and Tyler Breeze). July 2-3, 2016 – Live Event: The Golden Truth (Goldust and R-Truth) defeated Breezango (Fandango and Tyler Breeze). July 8, 2016 – Superstars: The Shining Stars (Epico and Primo) defeated Breezango (Fandango and Tyler Breeze). July 9-10, 2016 – Live Event: The Golden Truth (Goldust and R-Truth) defeated Breezango (Fandango and Tyler Breeze). July 11, 2016 – RAW: Breezango (Fandango and Tyler Breeze) defeated The Lucha Dragons (Kalisto and Sin Cara). July 14, 2016 – Smackdown: Kalisto defeated Tyler Breeze w Fandango. July 16-17, 2016 – Live Event: The Golden Truth (Goldust and R-Truth) defeated Breezango (Fandango and Tyler Breeze). July 19, 2016 – WWE Draft Live Special: Breezedango got drafted as a tag team by Smackdown Live. July 22, 2016 – Main Event: Jack Swagger and Mark Henry defeated Breezango (Fandango and Tyler Breeze). July 23, 2016 – Live Event: The Golden Truth (Goldust and R-Truth) defeated Breezango (Fandango and Tyler Breeze). The Big Show defeated Breezango (Fandango and Tyler Breeze) in a handicap match. July 24, 2016 – Battleground Kickoff: Breezango (Fandango and Tyler Breeze) defeated The Usos (Jey Uso and Jimmy Uso). July 29, 2016 – Main Event: Tyler Breeze w Fandango defeated Jey Uso. July 30-31, 2016 – Live Event: The Golden Truth (Goldust and R-Truth) defeated Breezango (Fandango and Tyler Breeze). August 2, 2016 – Smackdown Live: Randy Orton defeated Fandango w Tyler Breeze by disqualification. August 4, 2016 – Main Event: Tyler Breeze w Fandango defeated Jey Uso. August 11, 2016 – Main Event: The Hype Bros (Mojo Rawley and Zack Ryder) defeated Breezango (Fandango and Tyler Breeze). August 13, 2016 – Live Event: Cesaro, Sin Cara & The Golden Truth (Goldust & R-Truth) defeated Breezango (Fandango & Tyler Breeze) & The Shining Stars (Epico & Primo). August 16, 2016 – Smackdown Live: American Alpha (Chad Gable & Jason Jordan), The Hype Bros (Mojo Rawley & Zack Ryder) & The Usos (Jey Uso & Jimmy Uso) defeated Breezango (Fandango & Tyler Breeze), The Ascension (Konnor & Viktor) & The Vaudevillains (Aiden English & Simon Gotch). August 21, 2016 – SummerSlam Kickoff: American Alpha (Chad Gable & Jason Jordan), The Hype Bros (Mojo Rawley & Zack Ryder) & The Usos (Jey Uso & Jimmy Uso) defeated Breezango (Fandango & Tyler Breeze), The Ascension (Konnor & Viktor) & The Vaudevillains (Aiden English & Simon Gotch). August 23, 2016 – SmackDown Live: Chad Gable and Jason Jordan defeated Fandango and Tyler Breeze in the 1st round. August 27-28, 2016 – Live Event: Mojo Rawley and Zack Ryder defeated Tyler Breeze and Fandango. August 29, 2016 – Live Event: Chad Gable, Jason Jordan, Mojo Rawley and Zack Ryder defeated Fandango, Tyler Breeze, Konnor and Viktor. September 1, 2016 – Main Event: American Alpha (Chad Gable and Jason Jordan) defeated Breezango (Fandango and Tyler Breeze). September 15, 2016 – Main Event: Kane defeated Fandango w Tyler Breeze. September 17-19, 2016 – Live Event: Heath Slater and Rhyno defeated Jimmy and Jey Uso & Fandango and Tyler Breeze in a 3-way tag team match to retain. September 22, 2016 – Main Event: WWE tag team champions Heath Slater and Rhyno defeated Fandango and Tyler Breeze in a non-title match. September 24-25, 2016 – Live Event: Heath Slater and Rhyno defeated Chad Gable and Jason Jordan, Fandango and Tyler Breeze & Jimmy and Jey Uso in a 4-way tag team match to retain the tag team titles. September 29, 2016 – Main Event: Apollo Crews defeated Tyler Breeze w Fandango. October 7, 2016 – Main Event: WWE tag team champions Heath Slater and Rhyno defeated Breezango (Tyler Breeze and Fandango) in a non-title match. November 4, 2016 – Live Event: The Hype Bros (Mojo Rawley and Zack Ryder) defeated Breezango (Fandango and Tyler Breeze). November 5-7, 2016 – Live Event: WWE tag team champions Heath Slater and Rhyno defeated Breezedango (Tyler Breeze and Fandango) & The Usos (Jimmy and Jey Uso) in a 3-way tag team match to retain the tag titles. November 8, 2016 – SmackDown Live: Breezango (Fandango and Tyler Breeze) defeated The Vaudevillains (Aiden English and Simon Gotch) to qualify for the Survivor Series team. November 9-10 2016 – Live Event: WWE tag team champions Heath Slater and Rhyno defeated Breezango (Tyler Breeze and Fandango) & The Usos (Jimmy and Jey Uso) in a 3-way tag team match to retain the tag titles. November 11-13, 2016 – Live Event: Breezango (Fandango & Tyler Breeze), Heath Slater, Rhyno & The Hype Bros (Mojo Rawley and Zack Ryder) defeated The Ascension (Konnor & Viktor), The Usos (Jey Uso & Jimmy Uso) & The Vaudevillains (Aiden English and Simon Gotch). November 15, 2016 – SmackDown Live: American Alpha (Chad Gable & Jason Jordan), Breezango (Fandango & Tyler Breeze), The Hype Bros (Mojo Rawley & Zack Ryder) & The Usos (Jey Uso and Jimmy Uso) defeated The Ascension (Konnor & Viktor), The Head Bangers (Mosh & Thrasher), The Spirit Squad (Kenny & Mikey) & The Vaudevillains (Aiden English and Simon Gotch). November 18, 2016 – Main Event: Breezango (Fandango and Tyler Breeze) defeated The Vaudevillains (Aiden English and Simon Gotch). November 20, 2016 – Survivor Series: Team RAW (Big Cass, Cesaro, Enzo Amore, Sheamus, The Club (Karl Anderson & Luke Gallows), The New Day (Big E & Kofi Kingston) & The Shining Stars (Epico and Primo)) defeated Team SmackDown LIVE (Breezango (Fandango & Tyler Breeze), Heath Slater, Rhyno, The Hype Bros (Mojo Rawley & Zack Ryder), American Alpha (Chad Gable & Jason Jordan), The Usos (Jey Uso and Jimmy Uso)) in a tag team elimination match. November 21, 26-28, 2016 – Live Event: Heath Slater and Rhyno defeated Breezango (Fandango and Tyler Breeze) & The Usos (Jey Uso and Jimmy Uso) in a 3-way tag team match to retain the tag titles. November 22, 2016 – SmackDown Live: American Alpha (Chad Gable & Jason Jordan) defeated Breezango (Fandango & Tyler Breeze), The Ascension (Konnor & Viktor), The Hype Bros (Mojo Rawley & Zack Ryder), The Usos (Jey Uso & Jimmy Uso) and The Vaudevillains (Aiden English & Simon Gotch) in a tag team turmoil to become #1 contenders for the tag titles. November 29, 2016 – SmackDown Live: The Hype Bros (Mojo Rawley and Zack Ryder) defeated Breezango (Fandango and Tyler Breeze) in a dark match. December 3, 5, 2016 – Live Event: Heath Slater and Rhyno defeated Breezango (Fandango and Tyler Breeze) to retain the tag team titles. December 13, 2016 – SmackDown Live: The Hype Bros (Mojo Rawley & Zack Ryder) defeated The Ascension (Konnor & Viktor) and Breezango (Fandango & Tyler Breeze) and American Alpha (Chad Gable & Jason Jordan) and The Vaudevillains (Aiden English & Simon Gotch) and Heath Slater & Rhyno in a battle royal to become #1 contenders for the tag team titles. December 28-29, 2016 – Live Event: American Alpha (Chad Gable & Jason Jordan) defeated Breezango (Fandango & Tyler Breeze) and The Ascension (Konnor & Viktor) and The Usos (Jey Uso & Jimmy Uso) and The Vaudevillains (Aiden English & Simon Gotch) in a tag team turmoil to retain the tag titles. January 3, 2017 – SmackDown Live: SmackDown Live tag team champions American Alpha (Chad Gable and Jason Jordan) defeated Breezedango (Tyler Breeze and Fandango) in a non-title match. January 17, 2017 – SmackDown Live: Mojo Rawley defeated Tyler Breeze in a dark match. January 21-23, 2017 – Live Event: Heath Slater and Rhyno defeated Breezango (Fandango and Tyler Breeze). January 24, 2017 – SmackDown Live: Mojo Rawley defeated Aiden English, Curt Hawkins, Fandango, Heath Slater, Konnor, Rhyno, Simon Gotch, Tyler Breeze and Viktor in a battle royal to qualify for the Royal Rumble match. February 7, 2017 – SmackDown Live: The Ascension (Konnor & Viktor), The Usos (Jey Uso & Jimmy Uso) & The Vaudevillains (Aiden English and Simon Gotch) defeated American Alpha (Chad Gable & Jason Jordan), Breezango (Fandango & Tyler Breeze), Heath Slater and Rhyno. February 12, 2017 – Elimination Chamber: American Alpha (Chad Gable and Jason Jordan) defeated Breezango (Fandango and Tyler Breeze), Heath Slater & Rhyno, The Ascension (Konnor and Viktor), The Usos (Jey Uso and Jimmy Uso) & The Vaudevillains (Aiden English and Simon Gotch) in a tag team turmoil to retain the tag team titles. February 14, 2017 – SmackDown Live: Heath Slater and Rhyno defeated Breezango (Fandango and Tyler Breeze) in a dark match. February 21, 2017 – SmackDown Live: SmackDown Live tag team champions American Alpha (Chad Gable and Jason Jordan) defeated Breezango (Fandango and Tyler Breeze) in a non-title match. February 28, 2017 – SmackDown Live: American Alpha (Chad Gable & Jason Jordan), Heath Slater and Rhyno defeated Breezango (Fandango & Tyler Breeze) & The Ascension (Konnor and Viktor) in a dark match. March 7, 2017 – SmackDown Live: American Alpha (Chad Gable & Jason Jordan), Heath Slater and Rhyno defeated Breezango (Fandango & Tyler Breeze) & The Ascension (Konnor and Viktor) in a dark match. March 21, 2017 – SmackDown Live: John Cena defeated Fandango w Tyler Breeze. March 28, 2017 – SmackDown Live: American Alpha (Chad Gable & Jason Jordan), Heath Slater, Mojo Rawley and Rhyno defeated Breezango (Dolph Ziggler, Fandango, The Usos & Tyler Breeze (Jey Uso and Jimmy Uso). April 2, 2017 – WrestleMania 33 Kickoff: Fandango & Tyler Breeze were in the Andre The Giant Memorial Battle Royal won by Mojo Rawley. April 18, 2017 – SmackDown Live: Breezango (Fandango and Tyler Breeze) defeated The Ascension (Konnor and Viktor) in a dark match. April 25, 2017 – SmackDown Live: Breezango (Fandango and Tyler Breeze) defeated The Ascension (Konnor and Viktor) in a Beat The Clock Challenge to become #1 contenders for the tag team titles. May 4-8, 2017 – Live Event: Breezango (Fandango & Tyler Breeze) and Sin Cara defeated Aiden English & The Ascension (Konnor and Viktor). May 9, 2017 – SmackDown Live: Breezango (Fandango and Tyler Breeze) defeated The Ascension (Konnor and Viktor). May 10-12, 2017 – Live Event: Breezango (Fandango & Tyler Breeze) and Tye Dillinger defeated Aiden English & The Ascension (Konnor and Viktor). May 16, 2017 – SmackDown Live: Breezango (Fandango and Tyler Breeze) defeated The Colons (Epico Colon and Primo Colon). May 21, 2017 – Backlash: The Usos (Jey Uso and Jimmy Uso) defeated Breezango (Fandango and Tyler Breeze) to retain the SmackDown Live tag team titles. May 23, 2017 – SmackDown Live: Fandango defeated Jimmy Uso. Tyler Breeze defeated Jey Uso. The Usos (Jey Uso and Jimmy Uso) defeated Breezango (Fandango and Tyler Breeze) to retain the SmackDown Live tag team titles. May 27-29, 2017 – Live Event: Breezango (Fandango and Tyler Breeze) defeated The Colons (Epico Colon and Primo Colon). May 30, 2017 – SmackDown Live: Breezango (Fandango and Tyler Breeze) defeated The Colons (Epico Colon and Primo Colon). June 4-5, 2017 – Live Event: Breezango (Fandango and Tyler Breeze) defeated American Alpha (Chad Gable and Jason Jordan) & The Colons (Epico Colon and Primo Colon) in a 3-way tag team match. June 13, 2017 – SmackDown Live: Breezango (Fandango & Tyler Breeze) & The New Day (Kofi Kingston and Xavier Woods) defeated The Colons (Epico Colon & Primo Colon) & The Usos (Jey Uso and Jimmy Uso). June 18, 2017 – Money In The Bank: Breezango (Fandango and Tyler Breeze) defeated The Ascension (Konnor and Viktor). June 20, 2017 – SmackDown Live: Breezango (Fandango & Tyler Breeze) and Tye Dillinger defeated Aiden English & The Colons (Epico Colon and Primo Colon) in a dark match. June 24, 26, 2017 – Live Event: The Usos (Jey Uso and Jimmy Uso) defeated Breezango (Fandango and Tyler Breeze) & The New Day (Big E and Kofi Kingston) in a 3-way tag team match to retain the tag team titles. July 1-3, 2017 – Live Event: merican Alpha (Chad Gable & Jason Jordan) & Breezango (Fandango and Tyler Breeze) defeated Epico Colon, Erick Rowan & The Ascension (Konnor and Viktor). July 4, 2017 – SmackDown Live: AJ Styles defeated Dolph Ziggler and Epico Colon and Erick Rowan and Fandango and Jason Jordan and Konnor and Luke Harper and Mojo Rawley and Sami Zayn and Sin Cara and Tye Dillinger and Tyler Breeze and Viktor and Zack Ryder in a Independence Day #1 contenders battle royal for the United States title. July 15-17, 22, 2017 – Live Event: The Usos (Jey Uso and Jimmy Uso) defeated Breezango (Fandango and Tyler Breeze) & The New Day (Big E and Kofi Kingston) in a 3-way tag team match to retain the tag titles. July 29-31, 2017 – Live Event: The New Day (Big E and Kofi Kingston) defeated Breezango (Fandango and Tyler Breeze) & The Usos (Jey Uso and Jimmy Uso) in a 3-way tag team match to retain the tag titles. August 22, 2017 – SmackDown Live: Breezango (Fandango and Tyler Breeze) defeated The Ascension (Konnor and Viktor) in a dark match. September 2-4, 2017 – Live Event: The Usos (Jey Uso and Jimmy Uso) defeated Breezango (Fandango and Tyler Breeze) & The New Day (Big E and Kofi Kingston) in a 3-way tag team match to retain the tag titles. September 26, 2017 – SmackDown Live: Breezango (Fandango & Tyler Breeze), Chad Gable and Shelton Benjamin defeated The Ascension (Konnor & Viktor) & The Colons (Epico Colon and Primo Colon) in a dark match. October 1-2, 2017 – Live Event: The New Day (Big E and Kofi Kingston) defeated Breezango (Fandango and Tyler Breeze) & The Usos (Jey Uso and Jimmy Uso) in a 3-way tag team match to retain the tag titles. October 7, 2017 – Live Event: Breezango (Fandango & Tyler Breeze) and Chad Gable defeated Mike Kanellis and The Ascension (Konnor & Viktor). October 10, 2017 – SmackDown Live: Chad Gable and Shelton Benjamin defeat Breezango (Fandango and Tyler Breeze), The Ascension (Konnor and Viktor) & The Hype Bros (Mojo Rawley and Zack Ryder) in a fatal 4-way tag team match to become #1 contenders for the tag titles. November 2, 2017 – Live Event: Erick Rowan, Luke Harper & The Ascension (Konnor and Viktor) defeated Breezango (Fandango & Tyler Breeze) & The Colons (Epico Colon and Primo Colon). November 3-5, 2017 – Live Event: Breezango (Fandango & Tyler Breeze) & The Ascension (Konnor and Viktor) defeated Erick Rowan, Luke Harper & The Colons (Epico Colon and Primo Colon). November 6, 2017 – Live Event: The Usos (Jey Uso a ndJimmy Uso) defeated Breezango (Fandango and Tyler Breeze) & Erick Rowan and Luke Harper in a 3-way tag team match to retain the tag titles. November 7, 2017 – SmackDown Live: Breezango (Fandango and Tyler Breeze) defeated The Colons (Epico Colon and Primo Colon) in a dark match. November 8, 2017 – Live Event: The Usos (Jey Uso and Jimmy Uso) defeated Breezango (Fandango and Tyler Breeze) to retain the tag titles. November 9-12, 2017 – Live Event: The Usos (Jey Uso and Jimmy Uso) defeated Breezango (Fandango and Tyler Breeze), Chad Gable and Shelton Benjamin & The Hype Bros (Mojo Rawley and Zack Ryder) in a 4-way tag team match to retain the tag titles. November 14, 2017 – SmackDown Live: Breezango (Fandango & Tyler Breeze) and Tye Dillinger defeated Mike Kanellis & The Colons (Epico Colon and Primo Colon) in a dark match. November 19, 2017 – Survivor Series Kickoff: Kevin Owens and Sami Zayn defeated Breezango (Fandango and Tyler Breeze). November 25, 2017 – WWE Starrcade: Mike Kanellis, Rusev, The Bludgeon Brothers (Harper & Rowan) & The Colons (Epico Colon and Primo Colon) defeated Breezango (Fandango & Tyler Breeze), Sin Cara, The Ascension (Konnor & Viktor) and Tye Dillinger. November 26-27, 2017 – Live Event: Mike Kanellis, The Bludgeon Brothers (Harper & Rowan) & The Colons (Epico Colon and Primo Colon) defeated Breezango (Fandango & Tyler Breeze), The Ascension (Konnor & Viktor) and Tye Dillinger. December 16, 2017 – Live Event: Breezango (Fandango & Tyler Breeze) & The Ascension (Konnor and Viktor) defeated The Bludgeon Brothers (Harper & Rowan) & The Colons (Epico Colon and Primo Colon). December 17, 2017 – Clash Of Champions: The Bludgeon Brothers (Harper and Rowan) defeated Breezango (Fandango and Tyler Breeze). December 18, 2017 – Live Event: The Bludgeon Brothers (Harper & Rowan) & The Colons (Epico Colon and Primo Colon) defeated Breezango (Fandango & Tyler Breeze) & The Ascension (Konnor and Viktor). December 19, 2017 – SmackDown Live: Breezango (Fandango & Tyler Breeze) and Zack Ryder defeated Mojo Rawley & The Colons (Epico Colon and Primo Colon) in a dark match. December 26, 2017 – SmackDown Live: Breezango (Fandango and Tyler Breeze) vs. The Bludgeon Brothers (Harper and Rowan) ended in a no contest. December 28, 30, 2017 – Live Event: The Bludgeon Brothers (Harper and Rowan) defeated Breezango (Fandango and Tyler Breeze). January 6-7, 2018 – Live Event: The Bludgeon Brothers (Harper and Rowan) defeated Breezango (Fandango and Tyler Breeze). January 9, 2018 – SmackDown Live: Breezango (Fandango and Tyler Breeze) defeated Aiden English and Rusev. January 13-14, 2018 – Live Event: Breezango (Fandango & Tyler Breeze), Sin Cara and Zack Ryder defeated Mike Kanellis, Mojo Rawley & The Colons (Epico Colon and Primo Colon). January 27, 2018 – Live Event: Breezango (Fandango and Tyler Breeze) defeated Aiden English and Rusev. January 30, 2018 – SmackDown Live: Chad Gable and Shelton Benjamin defeated Breezango (Fandango and Tyler Breeze). February 11-12, 24, 26, 2018 – Live Event: The Bludgeon Brothers (Harper and Rowan) defeated Breezango (Fandango and Tyler Breeze). March 3-4, 2018 – Live Event: The Bludgeon Brothers (Harper and Rowan) defeated Breezango (Fandango and Tyler Breeze). March 10, 12, 2018 – Live Event: Breezango (Fandango & Tyler Breeze) and Zack Ryder defeated Mike Kanellis, Mojo Rawley and Primo Colon. March 11, 2018 – Fastlane Kickoff: Breezango (Fandango & Tyler Breeze) and Tye Dillinger defeated Chad Gable, Mojo Rawley and Shelton Benjamin. March 13, 2018 – SmackDown Live: Breezango (Fandango & Tyler Breeze) and Tye Dillinger defeated Chad Gable, Mojo Rawley and Shelton Benjamin in a dark match. March 17-19, 2018 – Live Event: Breezango (Fandango & Tyler Breeze) and Zack Ryder defeated Mike Kanellis, Mojo Rawley and Primo Colon. March 20, 2018 – SmackDown Live: Breezango (Fandango & Tyler Breeze) and Tye Dillinger defeated Chad Gable, Mojo Rawley and Shelton Benjamin in a dark match. March 27, 2018 – SmackDown Live: Dolph Ziggler defeated Tyler Breeze w Fandango. April 3, 2018 – SmackDown Live: Baron Corbin, Dolph Ziggler, Mojo Rawley and Primo Colon defeated Breezango (Fandango & Tyler Breeze), Tye Dillinger and Zack Ryder. April 8, 2018 – WrestleMania 34 Kickoff: Fandango was in the Andre The Giant Memorial battle royal won by Matt Hardy. 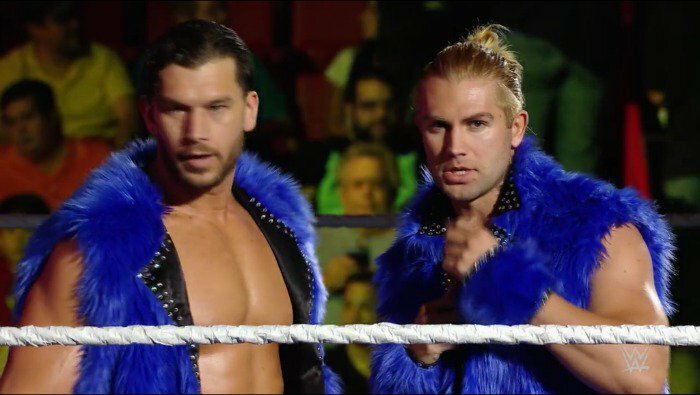 April 16, 2018 – RAW: Breezango were part of the Superstars shakeup and are now both members of Monday Night RAW. Breezango (Fandango and Tyler Breeze) defeated The Bar (Cesaro and Sheamus). May 4, 2018 – Main Event: Breezango (Fandango and Tyler Breeze) defeated The Revival (Dash Wilder and Scott Dawson). May 9, 2018 – Live Event: Breezango (Fandango & Tyler Breeze), No Way Jose & The Ascension (Konnor and Viktor) defeated Baron Corbin, Curt Hawkins, Jinder Mahal & The Authors Of Pain (Akam and Rezar). May 10, 2018 – Live Event: Dolph Ziggler and Drew McIntyre defeated Breezango (Fandango and Tyler Breeze). May 11-13, 2018 – Live Event: Breezango (Fandango & Tyler Breeze), No Way Jose & Titus Worldwide (Apollo Crews and Titus O’Neil) defeated Curt Hawkins, The Ascension (Konnor & Viktor) & Authors Of Pain (Akam and Rezar). May 14, 2018 – RAW: The B-Team (Bo Dallas and Curtis Axel) defeated Breezango (Fandango and Tyler Breeze). May 21, 2018 – RAW: The B-Team (Bo Dallas and Curtis Axel) defeated Breezango (Fandango and Tyler Breeze). May 27, 2018 – Live Event: Baron Corbin & The Authors Of Pain (Akam and Rezar) defeated Breezango (Fandango & Tyler Breeze) and No Way Jose. June 4, 2018 – RAW: The B-Team (Bo Dallas & Curtis Axel) defeated Breezango (Fandango & Tyler Breeze) and Dolph Ziggler & Drew McIntyre and Heath Slater & Rhyno and The Ascension (Konnor & Viktor) and The Revival (Dash Wilder & Scott Dawson) and Titus Worldwide (Apollo Crews & Titus O’Neil) in a battle royal to become #1 contenders for the RAW tag team titles. June 11, 2018 – RAW: Dolph Ziggler and Drew McIntyre defeated Breezango (Fandango and Tyler Breeze). June 15-16, 2018 – Live Event: Dolph Ziggler and Drew McIntyre defeated Breezango (Fandango and Tyler Breeze). June 22, 2018 – Main Event: The Authors Of Pain (Akam and Rezar) defeated Breezango (Fandango and Tyler Breeze). June 22-23, 2018 – Live Event: The B-Team (Bo Dallas and Curtis Axel) defeated Breezango (Fandango and Tyler Breeze) & Titus Worldwide (Apollo Crews and Titus O’Neil) in a 3-way tag team match. June 24, 2018 – Live Event: The B-Team (Bo Dallas & Curtis Axel) and Mojo Rawley defeated Breezango (Fandango & Tyler Breeze) and No Way Jose. June 29, 2018 – Main Event: Bobby Roode & Breezango (Fandango and Tyler Breeze) defeated Curt Hawkins & The Ascension (Konnor and Viktor). July 8, 2018: Fandango confirmed via his twitter page that he is injured. WWE.com confirmed that Fandango has suffered a Left Labrum tear in his shoulder and will require surgery to fix the issue, he will be out for a unknown amount of time.